[mks_dropcap style=”letter” size=”65″ bg_color=”#ffffff” txt_color=”#000000″]E[/mks_dropcap]mmanuel’s car is old and beaten up, but smells new. The Virgin Mary is perched on the dashboard; a moving pedestal for her bleeding, plastic Sacred Heart. Two rosaries jangle above her from the rear-view mirror, their beads swing wildly with each turn through Joburg’s Sunday morning CBD streets. I ask Emmanuel if he’s from Ethiopia, seeing that he’s taking 2Summers and me to an Ethiopian Orthodox church, as part of our #TheGodProject. “I’m from Eritrea,” he responds. I ask him if that war between Ethiopia and Eritrea is still going on, admittedly to just make conversation. He drops us off next to a Church of The Latter Day Saints, in a narrow side street that’s in the luminescent shadow of Ponte. A white-robed man in chinos squeezes past other robed people and introduces himself as Behailo, the “secretary of the church”. He’s warm and friendly, and tells us that we need to take off our shoes, and, because we’re women, we need to cover our heads. Fortunately it’s freezing cold and I’m wearing a snood, so I surreptitiously convert it into a make-shift head-scarf. I feel quite ridiculous, but no one is looking at me. The service appears to already be in full swing, and 2Summers and I are relegated to the back of the women’s section, along with the children. There are a lot of children; they crawl on the floor and squeal and smile and do things that kids do, which surprises me, as no one tells them to shush or keep still. Chanting mingles with incense. Mother and Child; Me and Snood. A large, gilded holy book appears. Everyone takes turns to kiss it – next to me a little boy in a bow tie is held up by his mother to plant his small lips on it. Suddenly it’s my turn, and my germaphobia forces me to awkwardly do the sign of the cross instead. The man holding the book gives a little laugh and moves to the next person. I have no idea what’s happening in the service, as it’s not in English, but it reminds me of a Catholic Mass, except with organised chaos and far more singing. Ethiopian script is projected onto screens at the front of the church, while psychedelic angels gaze down at the congregation below. There’s also a wedding going on – the regal bride and groom are right in the front, sitting on high-backed thrones – a king and queen of Zion, for the day. Half-way through the service, we re-group with Behailo in his office. We drink Fanta out of polystyrene cups, and I ask him to tell me about how he ended up in South Africa. Behailo explains, in broken English, that the Ethiopian Orthodox Church believes in Jesus Christ and the Holy Trinity. I ask him if it’s similar to the Catholic Church, because I’ve noticed a sameness, of sorts. 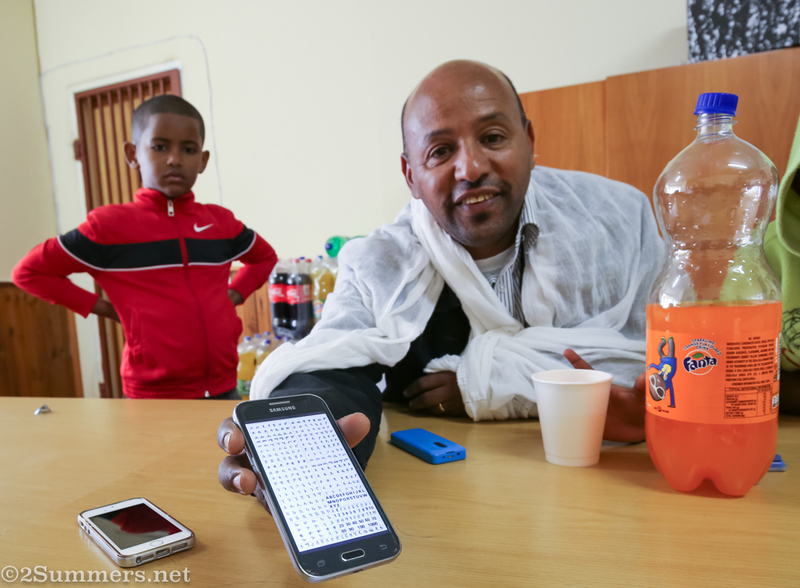 I feel like I’ve only scraped the surface of the Ethiopian Orthodox Church – plus the language gap proves to be a bit of an issue with Behailo, so a lot is lost in translation. I feel a little mystified by all of it: the ancient language, the heady incense, the icons, the white robes, the symbolism. What I do discover, thanks to some internet trawling, is that the Ethiopian strain of Christianity has a bit of a complicated history. Like its name suggests, it forms part of the Orthodox Christian grouping – an early, almost mystical form Christianity that emphasises the belief that through Christ, who is God made flesh (or incarnate), human nature can be transformed into the Divine (unlike Western Christian theology that focuses more on how to mitigate that pesky detail of human sin). There’s also use of icons, praying to saints and the Virgin Mary, and, like I’ve already mentioned, a whole lot of chanting and incense burning. Orthodox Christianity is divided in two: the Eastern Orthodox and Oriental Orthodox churches. Ethiopian Orthodoxy is part of the Oriental group, which includes the Armenian Apostolic Church; the Coptic Church of Egypt (which dates its origins to Mark the Evangelist way back in the first century); the Eritrean Orthodox Church; the rather obscure Church of St. Thomas in India; and the equally obscure Jacobite Syrian Church of Antioch. At a point in time the Oriental Orthodox Church was joined with the Eastern Orthodox Church (which comprises the Greek, Russian, Bulgarian, Romanian, and Syrian Orthodox churches), but then they had a big fight in 451 AD and there was a schism. For an excellent summary of the history of Christian Orthodoxy (that doesn’t make your head spin) go here. Before Christianity was introduced to Ethiopia, paganism and Judaism were apparently practiced side by side – the latter was a result of Ethiopian trade with the Middle East, and also explains why there is a fair amount of Talmudic influence in today’s Ethiopian Orthodox Church – it even claims that the Church of Our Lady Mary of Zion in Axum, the holiest city in Ethiopia, houses the original Ark of the Covenant (which contains the tablets that Moses supposedly inscribed the Ten Commandments on). The influence of Judaism is also emphasised in the Kebra Nagast (The Glory of the King), an ancient Ethiopian holy book, which recounts the visit of the Queen of Sheba to King Solomon in Jerusalem. Paraphrased from the BBC’s history website: Upon her return to Ethiopia, Sheba gave birth to Solomon’s son, named Menelik (‘Son of the Wise’). Years later Menelik travelled to Jerusalem to see his father, who invited him to remain there to rule after his death. But Menelik refused and decided to return home – and he took the Ark of the Covenant with him. He took it back to Axum, a kingdom in northern Ethiopia which was ruled by the Queen of Sheba (it’s also worth noting that when Prophet Muhammad faced oppression from the Quraish clan, he sent a small group, which included his daughter Ruqayya, to Axum). Followers of Ethiopian Orthodoxy believe that the Ark is still in Axum today, hidden in the courtyard of St Mary’s Church. When Solomon learned that the Ark had been stolen, he was furious. But he told the priests not to say a word – instead, Ethiopian Orthodox Christians believe that a copy of the Ark was placed in his eponymous Temple, so that Israel could still be seen as legit. According to that bastion of facts, Wikipedia, the Ethiopian Orthodox Church is the largest of the Oriental Orthodox churches, and the second largest Orthodox Church after the Russian Orthodox Church – Ethiopia is also the second country (only after Armenia), to officially recognise Christianity as a state religion (that was back in 333 AD). Tewahedo means “being made one” in Ge’ez, one of the ancient languages used during Ethiopian Orthodox worship. The “being made one” idea relates to the fact that the Ethiopian Orthodox Church, along with the Oriental strains of Orthodoxy, believe that the Divine and human nature are united as one. The leader of the Ethiopian Orthodox Tewahedo Church is the Patriarch Abune Mathias (his full title is a bit of a mouthful: “His Holiness Abune Mathias I, Sixth Patriarch and Catholicos of Ethiopia, Archbishop of Axum and Ichege of the See of Saint Taklehaimanot”. In the church’s parking lot, we speak to a charismatic and eloquent deacon by the name of Marvin Morgan. Each word that’s uttered from his mouth is done so with zeal and zest (in fact, with so much enthusiasm that my phone is covered in tiny droplets of spittle after interviewing him). Marvin Morgan is not Ethiopian, but he’s Eldorado Park’s answer to Obama. “Ethiopia’s King Haile Selassie was a prominent man in his time, and people like Bob Marley and Peter Tosh read King Selassie’s speeches, ” begins Marvin Morgan. “He was a profound man of peace unlike any other leader. He was concerned about the Civil Rights movement in the US, he advised Malcolm X, Dr Martin Luther King. A lot of us who are not Ethiopians start out being Rasta. In my case I had an objective coming to the Ethiopian church; my friend used to tell me that Ethiopians have their own language, so I was very interested in that, and I found out that Amharic has many similarities with Hebrew. I ask him if he’s still a Rasta. “I’m no longer a Rastafarian, it’s heresy. Why? Because those who do not want to come to the Ethiopian Orthodox Church still do not want to accept our Lord and Saviour Jesus Christ; they claim that they follow King Haile Selassie, yet he was a dedicated orthodox Christian. He was a deacon from the age of six; I used him as an example for myself. It encouraged me not to be scared because I was scared – I knew this would bring about a major change, a major transformation in my life and it was a good transformation. Hey Louise, it was very interesting indeed! I’m not sure about the 3xchanting – you could be right, but the Ge’ez was incomprehensible to me, and it was quite a cacophony… But there could easily have been a pattern to it. What interesting people you met there! Looking forward to the next installment? With the chanting and singing – is everything also repeated 3 times like in eastern Orthodox churches? From what I remember from Russian churches there was a big power of 3 (trinity) to all the rituals and ceremonies….